SARAO made a significant contribution to the Telescope Manager consortium, which is one of 12 engineering consortia representing 500 engineers in 20 countries building the SKA Observatory and Telescopes. Nine of the consortia focused on a component of the telescope, each critical to the overall success of the project, while three others focused on developing advanced instrumentation for the telescope. The Telescope Manager consortium was itself comprised of nine institutions in seven countries. The Telescope Manager consortium was formed in 2013 and was tasked with designing the crucial software that will control and monitor the SKA Observatory and Telescopes, essentially forming its central nervous system. This implies that the Telescope Manager element is connected to all other elements such as the correlator, science processor, dishes and low frequency aperture arrays, and coordinates their actions. The Telescope Manager will receive thousands of sensor updates per second, and needs to figure out what actions to take based on this information. The Telescope Manager also provides key stakeholders with user interfaces, for example it will provide operators with a view of the health and status of each telescope. The design of the SKA Telescope Manager has recently been subjected to a Critical Design Review (CDR), and has subsequently passed this stage gate, achieving a CDR closure certificate. The review was held in April of this year, was led by the SKA Organisation, and included a panel of international experts in the field. The Telescope Manager consortium is the first consortium out of twelve to pass this rigorous review. SARAO led the Telescope Manager System Engineering team involved in the design of this vital component, and also participated in the Management work package. SARAO team members acted as the primary authors of a range of important design artefacts, such as requirement and compliance specifications, interface control documents, construction and verification plans to name a few. Ray Brederode, Functional Manager for Software at SARAO, and his team comprising Paul Swart, Lize van der Heever and Gerhard le Roux, all from the Software Team at SARAO, participated in the design of the Telescope Manager element. “South Africa can be very proud of its contribution to the SKA Telescope Manager design, proving that we have world class engineers able to work on complex problems, like designing the world’s largest radio telescope,” says Brederode. “We are proud that the MeerKAT CAM system was selected as the reference design for TM. We also congratulate Professor Yashwant Gupta of GMRT in India, the TM Consortium Chair, for leading the first consortium to successfully achieve CDR,” says Dr Rob Adam, Managing Director of SARAO. While the Telescope Manager consortium now formally ceases to exist, the SKA Organisation continues to work with SARAO and the other former consortium members on the System Design and the SKA construction proposal, where its expertise will be required to ensure that the system design works in conjunction with the other elements. Telescope Consortium members included the the South African Radio Astronomy Observatory (SARAO); the Commonwealth Scientific and Industrial Research Council (CSIRO) in Australia; the National Research Council of Canada (NRC), TCS Research and Innovation and Persistent Systems in India; Italy’s National Institute for Astrophysics (INAF); Portugal’s ENGAGE SKA Consortium through Instituto de Telecomunicações (IT) and the School of Sciences of Porto University; and the UK’s Astronomy Technology Centre funded by the Science and Technology Facilities Council (STFC). 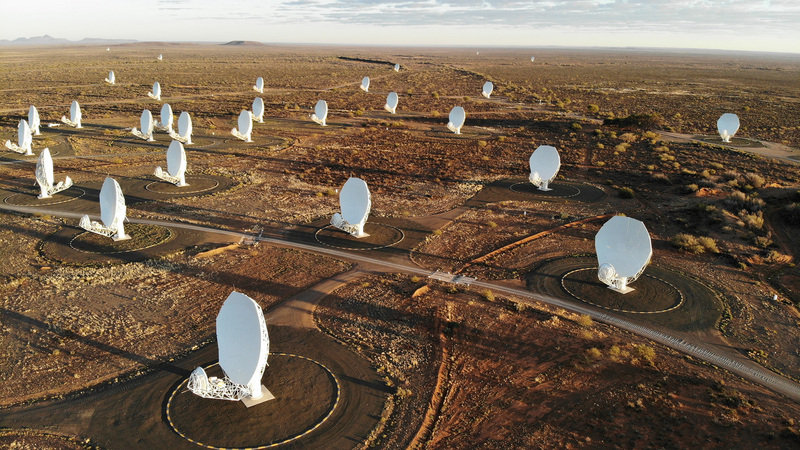 The 64-antenna MeerKAT radio telescope will be incorporated into Phase 1 of the SKA-MID telescope. Photo credit: SARAO.